With a total duration of 4 hours, this activity goes to the main attractions and landmarks of the city in your own private bus and let’s you truly discover Gaudi in Barcelona. Short stops are made from location to location allowing you to take in the most important and breathtaking places of the city. The Sagrada Familia, with the majestic yet unfinished work of Antonio Gaudi. The “Anella Olímpica de Montjuic”, found on the beautiful mountain, is where we will have our first pit stop, to regain energy for what lies ahead and mostly to take in the astonishing panoramic views of the city. This is a must for all of you photography lovers, and those who appreciate great views. 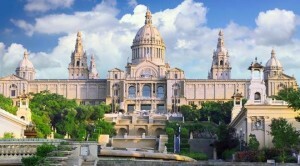 We will then make our way to the Gothic Neighbourhood, with is the heart and soul of the commercial side of Barcelona. This will give you the chance to see the back streets and oldest parts of the town, and you can buy a little souvenir for your loved ones. Barcelona, as we know, is the birth and death place of some of Spain’s most respected and famous artists, including painter, sculptors and authors. Many of which have their own museums. These are some of the places we will visit on the tour. This activity is perfect for those who want to take in as much about the city’s culture, history and art in the shortest time possible. Great way of vastly increasing your photo album and knowledge. Know that we also offer fully tailored tours, if there is any particular place or food you may want included or excluded. More sporty routes can also be arranged (check our guided bike tours below). This can include hiking also. Get in touch with us at any time with any enquiries you may have.